I've had the honor of baking cupcakes for various different events. Some for friends, family and others were clients. 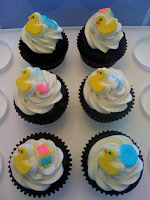 There are many people like me, who enjoy baking and decorating cakes/cupcakes for different occasions. With the amazing variety of decor available today for topping your baked goods, it just makes the whole process that much more fun. And if you're up for being even more creative, you can even make the toppings or toppers on your own. They don't always have to be edible. 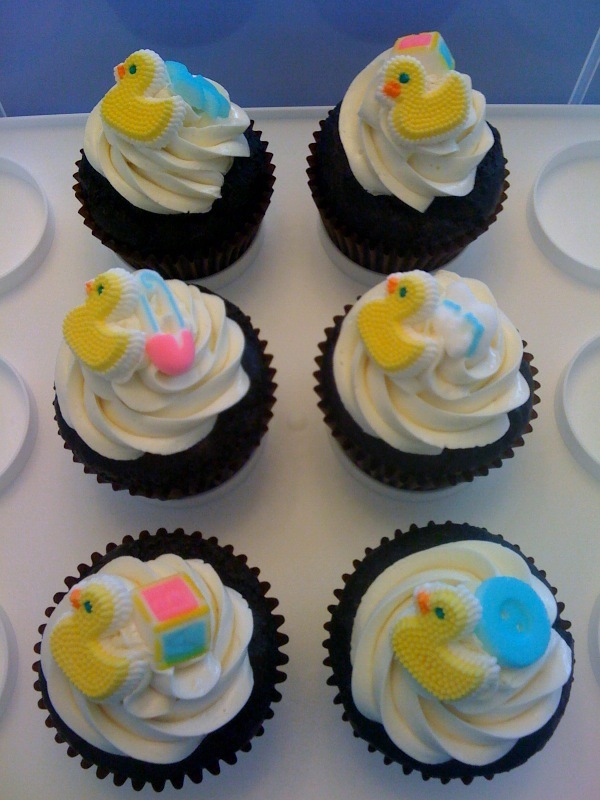 The image below is from a baby shower where i used rubber duckies as the toppers and filled the base of the ducks with some blue edible gel. It adds color and the they look like a puddle of water. Second image is from a bridal shower where i made black fondant flowers and used them as topper for a black and white theme shower. I have had play dates in the past with friends and their kids where we have baked. You would be amazed at how much fun kids have baking with you. It's a great learning adventure for them and a bonding time for you. It doesn't need to be perfect because all you need is some FUN! Another fun thing to bakes with kids is crayons. Yes, you read it right. Who ever thought you can bake crayons! I'm sure those of you with kids have broken pieces of crayons. And if not, get a box of crayons. They don't need to be anything fancy, just a cheap box of crayons. Start pealing them and break them into little pieces. Place them in a shaped cookie tray and bake in the oven at 275 until they melt completely. Remove, let them chill and the crayons will pop right out of the tray. Super fun and easy! This is the one time you'll tell your child to peel away the crayons and break them all they want :). Here are some pictures of the crayons we baked, and the sugar cookies we made from scratch for a play date. One of the events that i had fun putting the cupcakes together was for an Annaprashan. This is an event in the South Asian culture where a ceremony is held for a baby for his/her first feeding of solid food. My client provided me with the toppers she wanted which consisted of chocolate coins, ring pops, chocolate crayons, story book flags and fruit which i used fresh blueberries. On the menu were marble cupcakes with chocolate frosting, red velvet cupcakes with cream cheese and blueberries and cream cupcakes with whipped cream frosting. Here are some pictures. 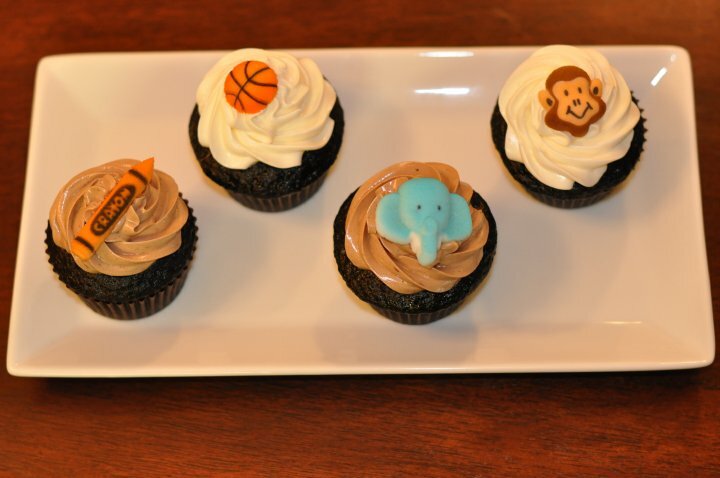 Last but not least, there are edible sugar toppers that come in different shapes, theme and colors. They are quick and easy to place and they look great. Using items like cookies, chocolate, fresh fruits is also another way to make your cupcakes and cakes look amazing. Here are some pictures. Hope this will give you some idea's on how to be creative and fun with baking!